In the previous tutorial, we learnt about af:panelGroupLayout control with Vertical layout option. In this Oracle ADF tutorial, we will explore af:panelGroupLayout control with a combination of both Horizontal & Vertical layout options. We will try to understand af:panelGroupLayout with the help of its HTML equivalent tags. To use it effectively, it is good to understand what happens on the browser side. When you use the af:panelGroupLayout with a combination of HORIZONTAL layout and VERTICAL layout options, what happens on the browser side? layout = “horizontal” in af:panelGroupLayout will create a HTML “table” tag with 1 row “tr” and 1 cell (or column) “td” tag defined inside a “tbody” tag. Each element added to it will become a HTML cell (or column) “td” tag. 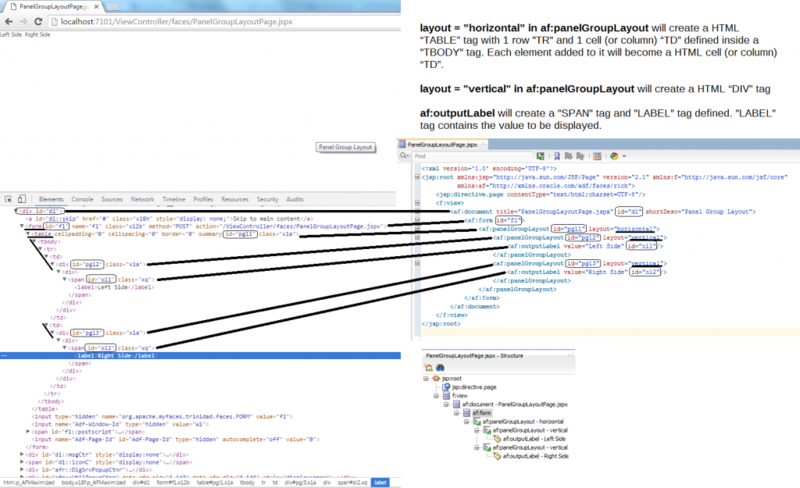 layout = “vertical” in af:pnaelGroupLayout wil create a HTML “div” tag. af:outputLabel will create a “span” tag and “label” tag defined. “label” tag contains the value to be displayed. In this sample scenario, I’ve chosen a panelGroupLayout with ‘horizontal’ layout as the top-most layer which creates a row “tr” and it contains 2 panelGroupLayout with ‘vertical’ layout which creates 2 cells (or columns) “td” tags.